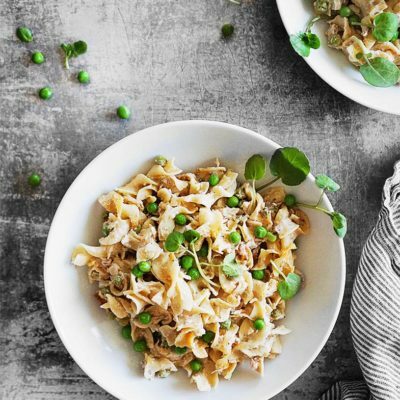 This delicious & easy Tuna Noodle Casserole comes together in just under 35 minutes and requires very few ingredients, making it perfect for weeknight dinners! Note: This recipe was originally published in Sept 12 2012. It was updated in April 2019 to revise the content and photographs. The original recipe remains the same. Enjoy! Even though I love to whine complain about how hot is still here, I can’t help myself from turning the oven to bake yummy things. Most people save casseroles for the fall and winter but not me! 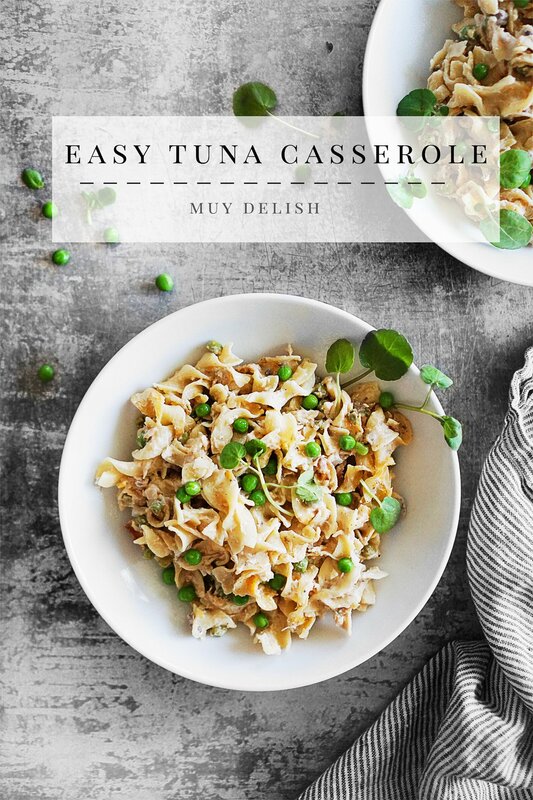 I think I made this Tuna Noodle Casserole about 3 times during the summer but can you blame me? 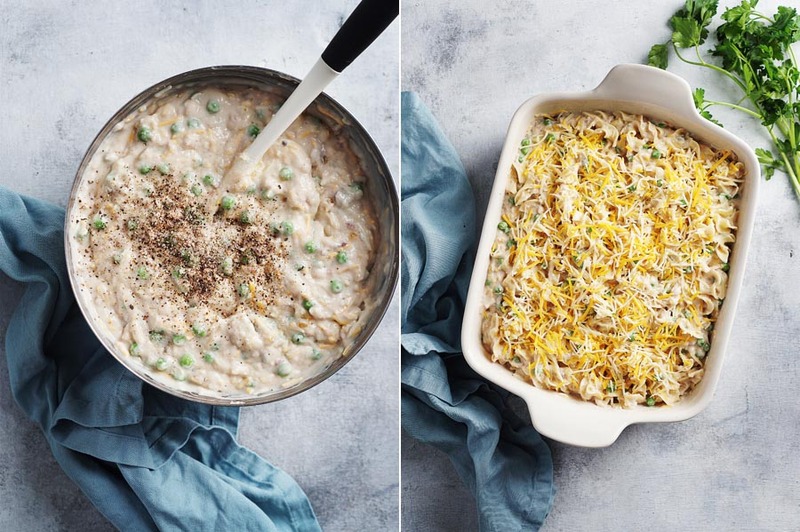 It’s so easy to whip together during busy nights and it’s so good! So good. 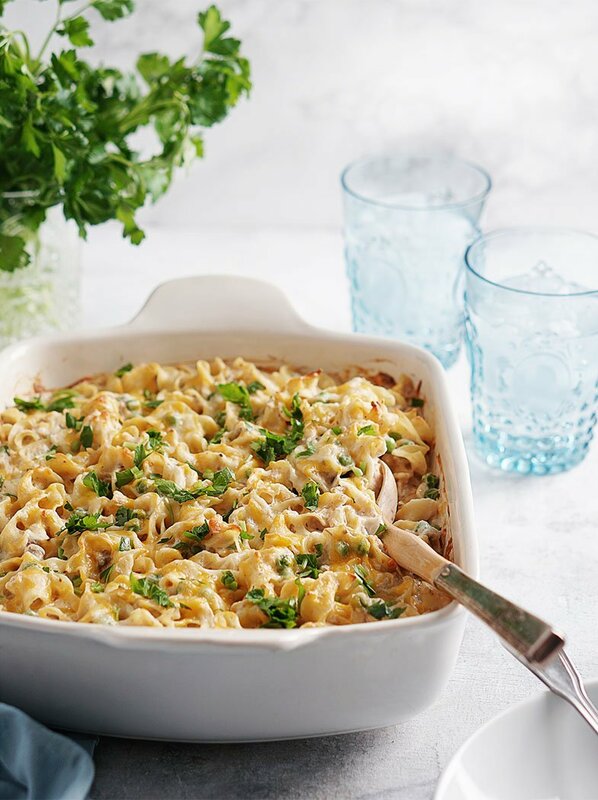 My hubby is kind of picky when it comes to his Tuna Casserole so to get it just perfect I sauté the onions in butter, add milk & use a big can of cream of mushroom soup to make it creamier – can’t have a dry casserole right?! This recipe requires very few & accessible ingredients. 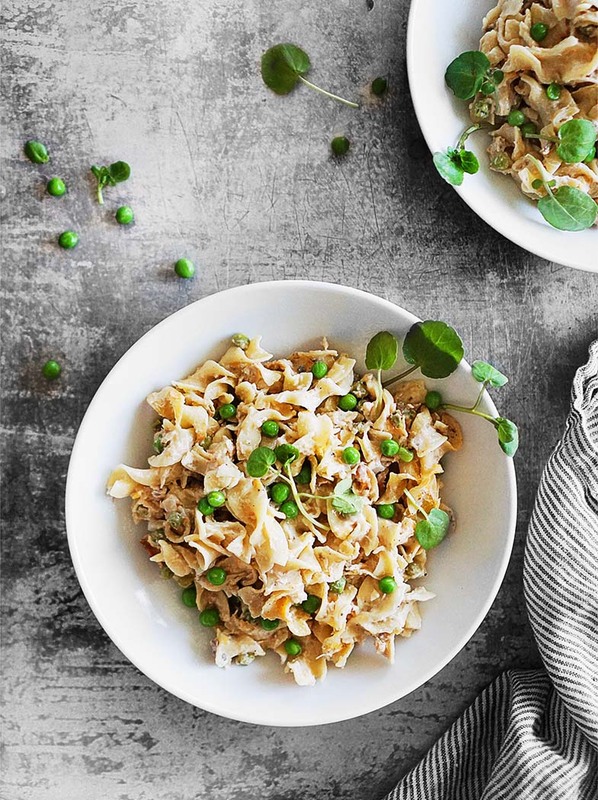 All you need is egg noodles, 2 white tuna cans, frozen peas, a little bit of onions, cream of mushroom soup, shredded cheese, a little butter and some milk. If you want to get fancy with your garnish, you can add chopped parsley, micro greens or even some more indulgent toppings such as crumb topping, or onion ring crumbs. While the pasta is cooking, heat a small skillet and cook the onions with the butter until the onions are soft . In medium bowl, add all of the remaining ingredients (reserve 1/2 cup of cheese for the topping) and mix well. When the pasta is ready, drain and transfer to a casserole. Add the tuna mixture and mix until combined well. 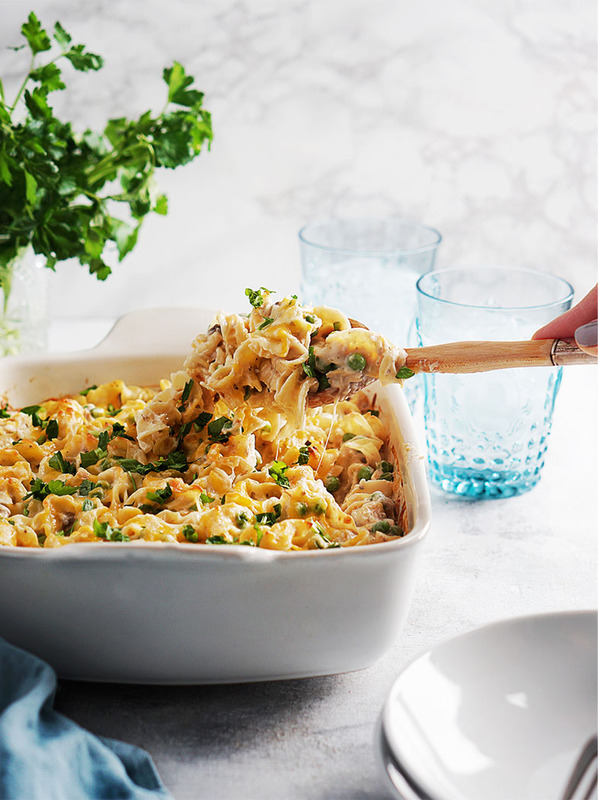 Sprinkle with the remaining 1/2 cup of shredded cheese and bake for 20 minutes or until the top begins to brown. Preheat oven to 425 degrees F. Spray with cooking spray a 9×13 inch baking dish. Bring a large pot of water to a boil. Cook pasta for about 10 to 12 minutes or until al dente; drain and rinse under cold water. 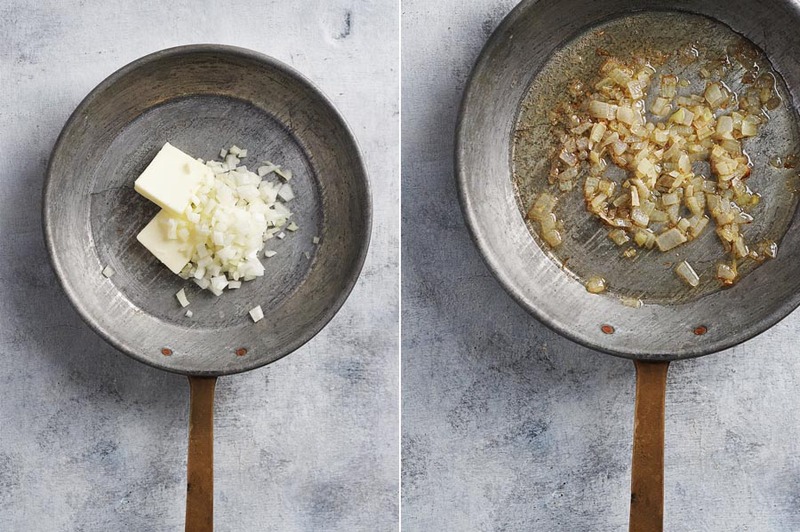 Saute the 1/4 cup onions in the 2 tablespoons of butter until soft. 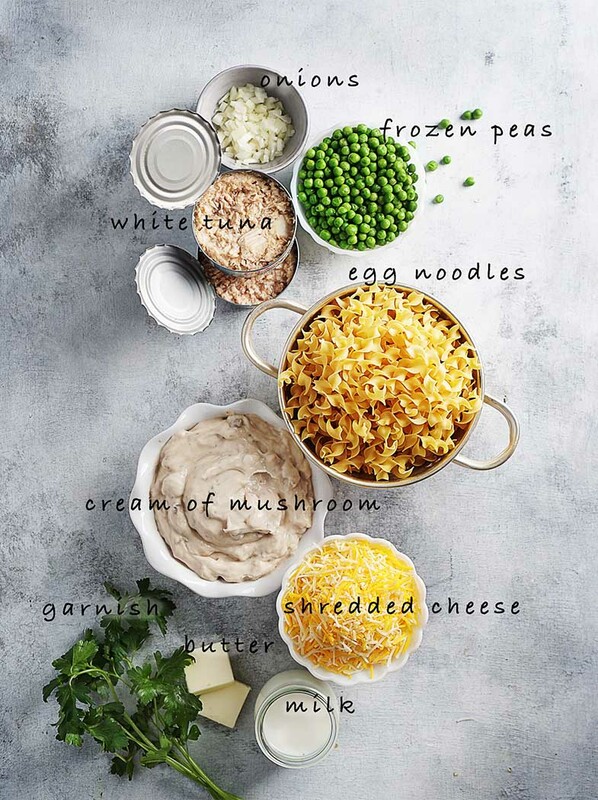 In a large bowl, mix all ingredients except the noodles (Note: reserve 1/2 cup of cheese to add on top of the casserole). Add the noodles and mix thoroughly. Transfer mix to the prepared baking dish and sprinkle the remaining 1/2 cup of shredded cheese. Bake for 20 minutes or until the cheese is completely melted. I think I know what I want for dinner tonight.